DRIVE WITH LIGHTS ON LOW BEAM. 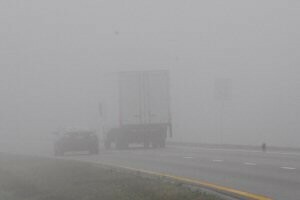 High beams will reflect back off of precipitation, smoke or fog and further impair visibility. Keep all vehicle lights in good working order to avoid collisions. Keep the windshield and headlights clean to reduce glare and increase visibility.